Every time a new VR shooter is announced or shown off, people want to know if it supports full locomotion options. Enough with the nausea hysteria! comment sections cry out. We want full movement with our joysticks and trackpads. It works for most people without making them sick in games like Onward or DOOM 3: BFG Edition, so why not all games!? Releasing seemingly out of nowhere, Croteam and Devolver Digital have arrived to not only bring Serious Sam into VR once again, but also to deliver on the wishes of intrepid early adopters of immersive VR headset technology. 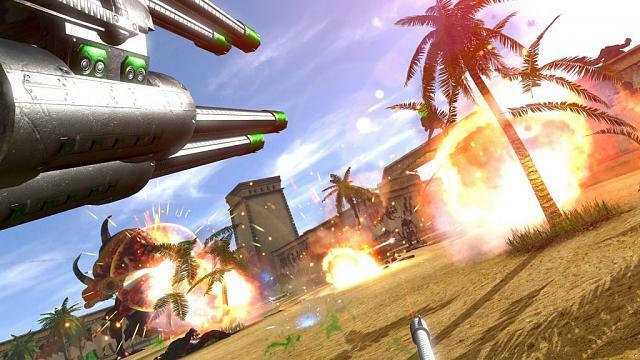 Earlier this year, Serious Sam VR: The Last Hope released on Steam Early Access, as well as on Oculus Home, to deliver one of the most intense, high-quality, wave shooters weve seen in VR yet. There is zero locomotion in that game not even teleportation and the entire experience can be played within your 180-degree front-facing view. Point and shoot; thats about it. What it lacked in depth however, it made up for with a ton of gore and bombastic fun to push it through as a veritable good time. 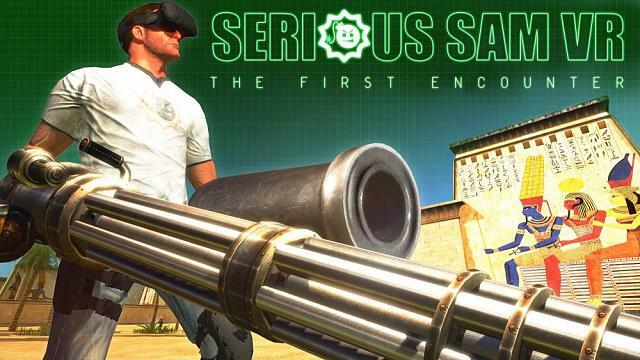 Now with Serious Sam VR: The First Encounter, weve got something a bit different. For those unaware, lets take a quick history lesson. The original Serious Sam game, known as Serious Sam: The First Encounter, released back in 2001. The most accurate comparisons you could draw would be to that of the Duke Nukem, Unreal, and Quake franchises. The games were all about speed, intensity, large arsenals of weapons, and lots of gore. The Second Encounter followed it in 2002, with Serious Sam 2 releasing in 2005. The First Encounter and The Second Encounter each got remastered in HD in 2009 and 2010, respectively, before the release of Serious Sam 3: BFE in 2011. Fans are still waiting on Serious Sam 4 and there have been several spin-offs across a variety of developers and genres, but the core competenicies of over-the-top action, humor, and violence run true in them all. When The Last Hope released earlier this year, it was met with positive results, even for a rather simplistic wave shooter. We came away quite impressed from our E3 preview and recent hands-on of the Early Access iteration. But today, Serious Sam VR: The First Encounter has launched in Steam Early Access as a full VR port of the 2009 HD remaster of the very first game. That means all of the single player campaign, the cooperative multiplayer, and the competitive multiplayer is fully playable in VR, with motion controllers, and fully functioning locomotion or teleportation movement. In total there are 15 campaign levels to play through, 10 different weapons to choose from, dozens of enemies, and several different difficulty settings. On the multiplayer side of things, you can play with up to 16 total players in the campaign mode, or wave-based survival mode, as well as competitive matches. Competitive play consists of many classic match types, such as deathmatch and team deathmatch, last man standing, and capture the flag. Thats a lot of content to cram into a single release and may offer the most variety of any VR shooter weve seen yet. Additionally, for the first time in the original escapade, The First Encounter, you can now dual-wield weapons. Two chainsaws, two miniguns, a shotgun and a revolver whatever you want. Youre no longer limited to a single weapon as each tracked motion controller gives you firepower. Since this is a fast-paced VR shooter, movement is a big talking point. With Serious Sam VR: The First Encounter, you can either choose teleportation-based movement, or full trackpad locomotion. Teleportation works much like it would in any other shooter youve tried, moving you in small increments. This is preferable if youre prone to motion sickness, but in all honesty, if you are, then this is just probably not the best game for you. When using the trackpad or joysticks for movement, it feels a little bit like youre skiing across the ground. For the Vive, simply placing my thumb on either trackpad while holding my guns out in front of me would cause Sam to move in that direction. I could slide my thumb to the side or down to strafe and change direction. Rotation either up, down, or from left to right I was only able to accomplish by moving my head in 360-degree space. Its a game that essentially requires at least a standing 360 space for optimal enjoyment, if not full roomscale to achieve the best results. Using the Oculus Touch controllers felt more natural, as the control stick was a much more intuitive movement device than the Vives inaccurate touchpad. And since Im not one thats typically susceptible to VR sickness, it was surprising that I did feel myself start to get a bit dizzy at times. Particularly during multiplayer matches on levels like the Desert Temple, which feature a lot of launch pads, my legs got wobbly. But thats what the optional teleport method is for. I also found it incredibly awkward to use the grip button to jump on the Vive controller. During matches, players that were using teleportation movement often appeared to be glitching across maps when they were in fact just using their preferred teleportation method of movement. As a result, it was often difficult to track them while shooting, which felt a bit silly and unfair from the perspective of a player using full standard locomotion. The core of the game is about what youd expect from something that originally released 15 years ago. Levels are mostly linear with some hidden secrets here and there, enemies often resort to the run directly at you while screaming, shooting, or exploding strategy of early 2000s AI technology, and the textures are flat and bland, even for something that was remastered in 2009. Visually, its not the prettiest thing Ive seen in a VR headset, but I dont think it needs to be. Right now in the VR market, if you want a fast-paced shooter in the style of Unreal, Quake, or Serious Sam, there arent many options. Most of the prominent competitive shooters on VR devices are either platform exclusives, such as RIGS on PS VR, take place in space, such as EVE: Valkyrie, or feature an obtuse control scheme, such as Hover Junkers, or the teleportation-only format of Arizona Sunshine. Onward has full movement, but scratches a very different military simulation itch, and Battle Dome is more like Splatoon than an action-packed shooter like this. Its a far cry from the breakneck speeds and gratuitous violence on display here. What youll find with Serious Sam VR: The First Encounter is a 15-year old game with a relatively fresh coat of paint, new control methods, and the same rip-roaring intensity you remember. Its not really new or inventive, but it fills a void that VR gamers have been craving for quite some time. Serious Sam VR: The First Encounter is now available on Steam Early Access with official support for the HTC Vive and Oculus Rift with tracked motion controllers required. The full price is $39.99, but there is currently a 10% discount until 12/27. Additionally, if you own Serious Sam HD: The First Encounter on Steam, you can earn an additional 10% discount, as well as another 20% discount if you own Serious Sam VR: The Last Hope. That game looks SERIOUS! lol Actually it kind of reminds me of Duke Nukem. Once again? I didn't realize there was a first Serious Sam VR game. How did I miss that?